Cockermouth's lorry pull used to be a popular event, but has not happened for a number of years. 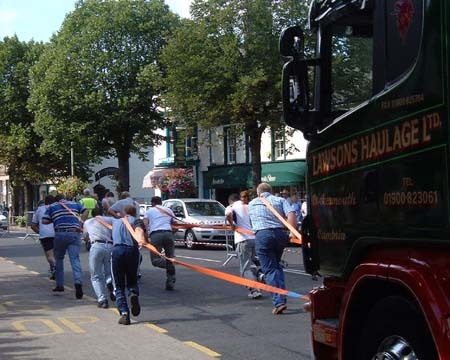 It drew a large crowd on Sunday August 28 2004 as eight teams took it in turns to haul a nine-tonne Lawsons Haulage truck 112 yards along the town's Main Street. 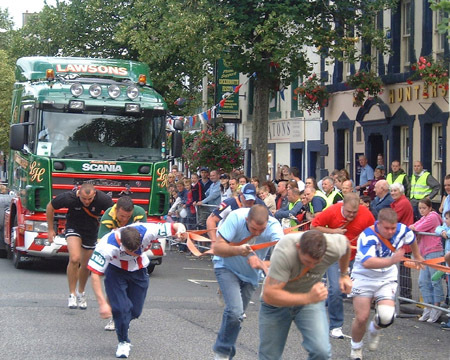 The popular event, organised by Lawson's Haulage of Cockermouth, was a trial of strength and a triumph of fundraising. The winning team, from Corus Steel in Workington, achieved the gruelling challenge in an impressive 36.25 seconds. Lawson's accounts manager, Jacqui White, said: "The winning team did it in 34 seconds last year but there was no wind then. This time they were up against a head wind, so 36 seconds is a good time."